Goodbye 2014, a year in review. Wow, what a year for Camelot Hills. This year we began raising dairy goats and gave our farm a name because of it as the ADGA (American Dairy Goat Association) requires it, and we couldn’t be any more happy about it. What started out as a simple 4H project with just a couple goats has turned into 6 dairy does (Alpine and Nubian), 2 herd sires (Nubian) with many on the way this spring. Camelot Hills has become more than just a project, it has expanded our lives in ways we could have never imagined. We acquired our first two dairy goats from Joburg Acres, a local 4H’r, and they happen to be bucks. Then the plan to get a single Senior doe from Heaven’s Jubilee farm in Starkville, MS turned into getting the Senior Doe and her 4 month old kid as well. These were Ain’t I Something Mister and Melody. We were going to just get a doe simply so we could learn about how to care for and milk a senior doe first. However having her kid around was just an added bonus. We got them settled in and then a short time later, off to Soraco Farms in Vicksburg, MS for an opportunity to get two young doe kids. These two were I’m A Beauty Queen (who took 4H Reserve Junior Best in Show at the State Show in Summer) and She’s A Lady. Lady has been a bit small throughout the year, but with some diet modification, is coming along really nicely. So things are going well, we’re getting fences up, separating our acreage for our does and creating the bucks a separate bachelor pad of their own. And then we learn of another doe, a 2 year old Alpine just around the corner at Sweet Chariot Farms, so we go visit and of course bring home Marlena, a sundgau alpine. A short time later, we get yet another opportunity to pick up, and get this, the kid of Marlena named Monica a gorgeous little broken Chamiosee alpine. So we have all our ladies and gents and bred the ones to be bred and are patiently awaiting kids in spring to see what our bucks will throw and what Barnibus from Sweet Chariot farm will throw. Can’t wait. Early on in the year we found a trailer to transport our goats in after many months of looking, an old pastured trailer that was very well used, rusted and dented up. It needed a lot of work but it was structurally sound and we got an awesome deal on it. 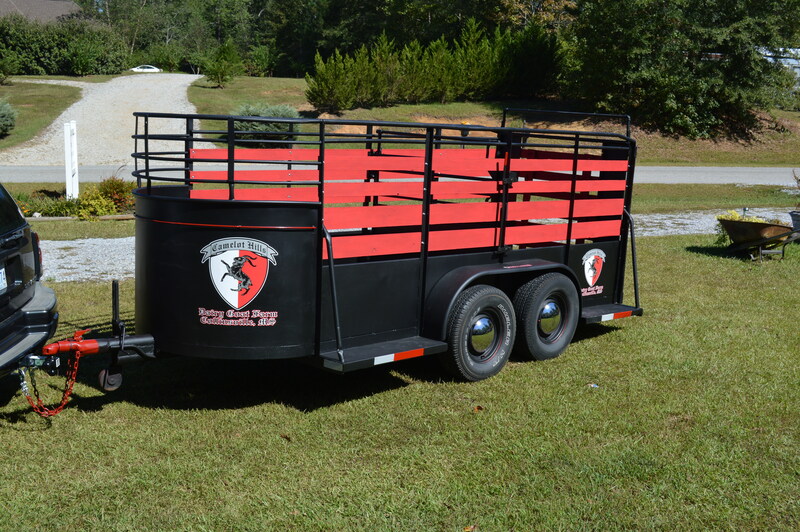 So, we bought it brought it home and a couple months and many hours of hard labor later we have an outstanding trailer, althought it’s not quite finished, we still have to put the top back on it and light it up! Of course toward the end of the year we work on the new mini-barn for housing the goats. We moved them into their new barn on Christmas Eve and are in the process of turning their old shelter into a milking parlor. We posted a video up on the new barn to our Youtube channel here. It’s not quite complete, but it was good enough to move the goats into. Now, it’s on to getting the milking parlor ready and finishing up the barn. All in all, we have had a good year. We have learned a lot of useful information about how to care for, breed and show dairy goats. Jessica has learned so much about youth Showmanship and I have been studying judging and conformation so I know what to look for. Jenny is always making sure we’re both doing things right around the farm and keeping us both busy! Junior helps out when we need him, although he doesn’t show them, he cares for them just the same. So, it’s been a good year for goats. Now it’s time to prep and get ready for the three 4H shows back to back to back, all within about a 3 week period in January and February. We love it! From all of us at Camelot Hills, we hope you have a prosperous year to come. Don’t forget to subscribe to our newsletter, Like us on Facebook and Subscribe to our Youtube Channel.